The Admiral has come too far to turn back. And suddenly, I was at peace again. Huh? I looked through my event log. 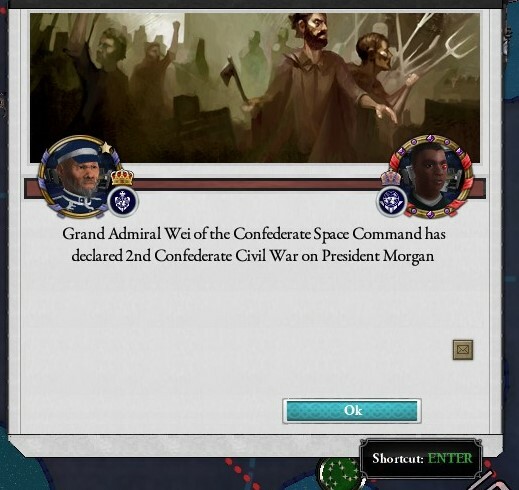 “2nd Confederate Civil War has ended inconclusively (Casus Belli no longer valid)”. 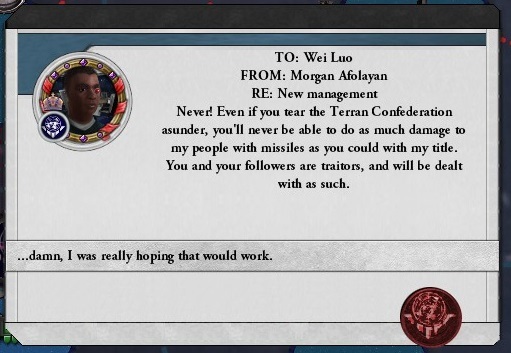 Welcome to Crisis of the Confederation, a space opera mod for Crusader Kings II. As the above bug suggests, the mod is still a work in progress (v0.12 at the time of writing), and I’m not yet sure how well the CK2 mechanics translate to the new setting. All the same, Crisis’ concept and sheer ambition make it one of the most interesting mods I have seen. If base CK2 – and Paradox games, more generally – are about the evolution of modern government, Crisis is about its fall. When the game begins, the Terran Confederation – an elective galactic republic – is crumbling. The frontier has declared independence (the titular Crisis). And within the Confederation, a few ambitious individuals are wondering if, perhaps, the galaxy needs a Terran Empire. As such, Crisis subscribes to a “cyclic history” theory of galactic politics that would be right at home in a classic science fiction novel2. I don’t think this is a coincidence – its stated inspirations include Dune and Foundation, as well as Emperor of the Fading Suns (and even Mobile Suit Gundam). 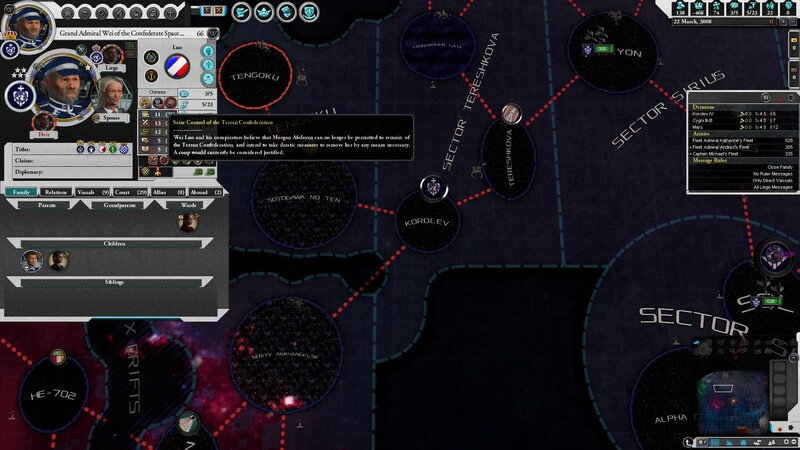 From a mechanical perspective, by virtue of being based on CK2, Crisis stands out as one of the few character-driven space strategy games. Judging from previews, it may be even more character-driven than Stellaris. Rulers can clone themselves to produce heirs. Admirals lobby to have their children appointed as their successors. The Confederation breaks apart due to the ideologies, and ambitions, of named individuals. At least on paper, this is the space game I’ve always wanted. For that ambition, Crisis deserves a look (grab it from the Steam Workshop here) — although I’d hold off serious play until, at least, that coup/civil war bug is fixed; that feature is pretty central. Until then, kick the tyres, soak in the lore, and enjoy the new music. I look forward to future versions of the mod!